OmniAir Consortium®, the leading industry association promoting interoperability and certification for ITS, tolling, and connected vehicles, along with Propulsion Québec, the province’s cluster for electric and smart transportation, announce a premiere connected vehicle testing event, to take place in the greater Montreal metropolitan area, May 6-10. The OmniAir Québec Plugfest, hosted by Propulsion Québec is a five-day event where the global vehicle-to-everything (V2X) community comes together to advance this life-saving communications technology. The connected vehicle workshop and the week-long testing event will take place at Transport Canada’s Motor Vehicle Test Centre operated by PMG Technologies in Blainville, Canada. 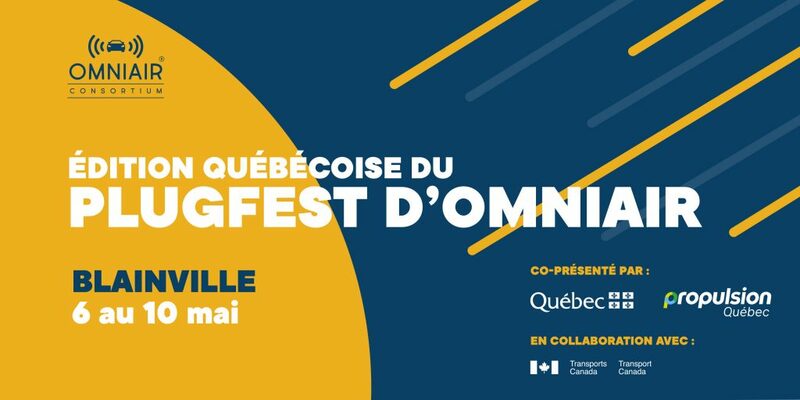 The Québec Plugfest will be OmniAir’s fourth connected vehicle event where participants will test both DSRC and C-V2X based connected vehicle devices. Over the past two years, OmniAir Plugfests have grown in complexity and scale culminating in our largest event to date, the Québec Plugfest. Every OmniAir Plugfest event has sold out at least two weeks before registration closed. 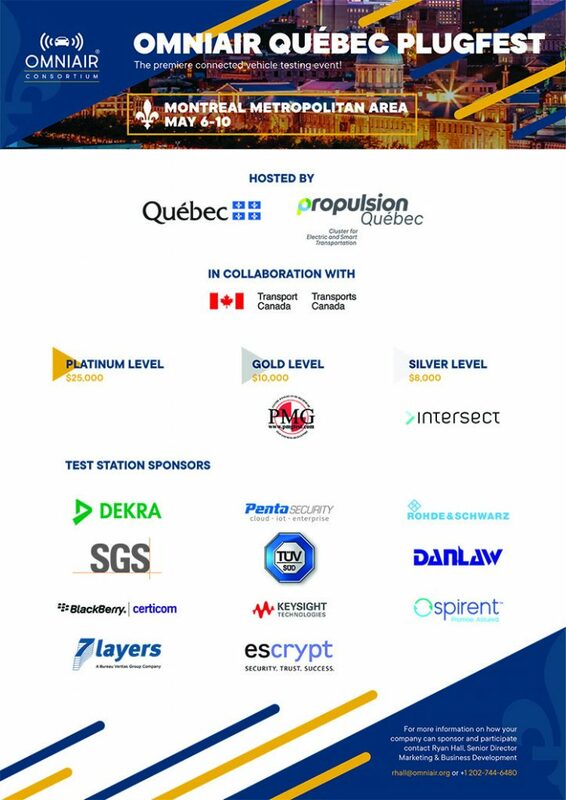 OmniAir’s Québec Plugfest begins with a Connected Vehicle Workshop featuring expert panelists discussing technical and policy issues that arise from connected and automated vehicles including cybersecurity, privacy, deployment and certification followed by an evening networking reception. The workshop will spill over into day two, with highly technical workshops and guided tours of the test track and bench testing area. During the tour, representatives from OmniAir, OmniAir Authorized Test Laboratories (OATL) and OmniAir Qualified Test Equipment (OQTE) providers will answer questions about the tests and the importance of certification. Intensive conformance, interoperability, security, and field testing across multiple testing stations, will begin in full the second day. The testing portion of the event is strictly reserved for those actively engaged in testing. For more information on how your company can sponsor and participate contact Ryan Hall, Senior Director Marketing & Business Development: rhall@omniair.org or +1 202-744-6480; Tickets for the event can be purchased at our event website.